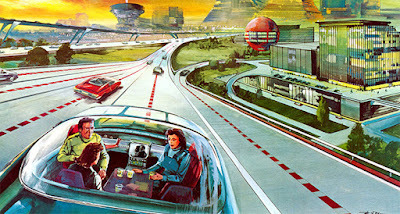 Futurists in the early 1960s predicted that someday Americans would be transported in driver-less vehicles. I thought that was too big a stretch at the time, but look what happened...meet the Google self-driving car. Looking at the popular technological literature in the 1960s is a study in contrasts. 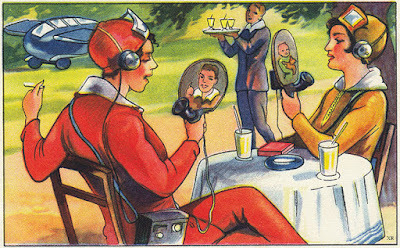 Anticipated inventions were often illustrated by using contemporary hardware in fantastic future predictions. Does the illustration above remind you of anything? It sure looks like the forerunner for Smart Phones to me! I certainly never thought that there would be underwater homes like predicted in the above illustration. Fifty and 60 years ago gee-whiz films depicting life today were a staple—a sure way to wow audiences. 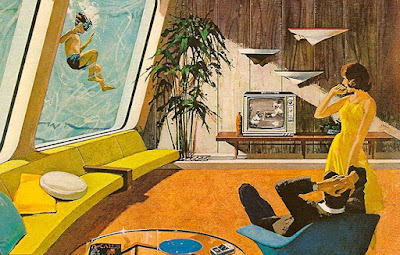 Today these fanciful visions of the future live on, on YouTube. As it turns out, though, there’s more technological progress predicted than social progress in the 1960s. The woman’s place in that “futureland” was by the (microwave) oven. Fortunately, Women today aren't stuck in the kitchen. Science fiction author, Arthur C. Clarke, predicted robotic surgery in 1964. He was right on. There's hundreds of other examples out there. I just want to whet your appetite to research some more. Remember, knowledge is power and learning can be fun.